I will admit that Twitter can be challenging at times. Just like any social media platform, Twitter can drain you of your valuable time which is why you have to be strategic when using Twitter. 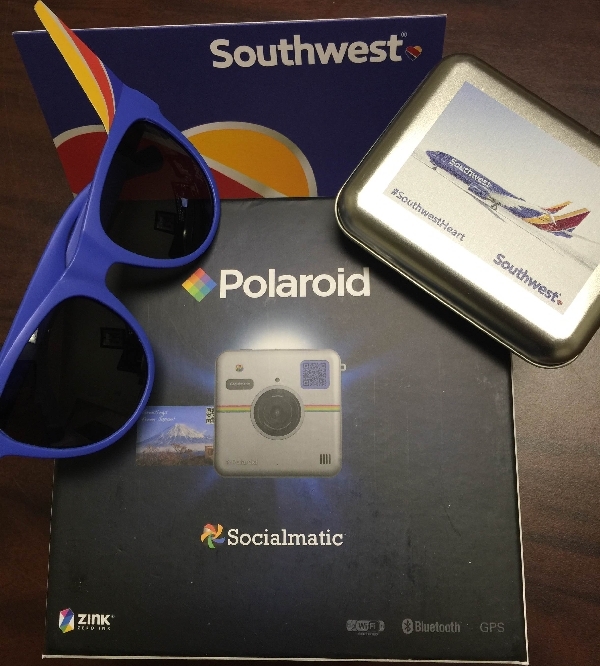 The iPhone photo on the left represents a few items that Southwest Airlines sent to me thanks to a Tweet. Yes, that's a Polaroid camera that I got for FREE because of a Tweet. As a photographer, I simply Tweeted that I was headed to cover a conference. I was flying on Southwest to get to my destination and simply pinged Southwest on my Tweet. Within minutes, Southwest replied and asked me to DM (direct message) them because they had something to send me. I have managed to get in front of numerous brands thanks to Twitter. In the photography world, Canon, Manfrotto, ThinkTank and a few others have either liked, re-Tweeted or replied to my Tweets. Outside of Photography, I have gotten in front of other brands for both compliments and complaints. I had a bad experience at a National Brand restaurant for a party of 12 or so people and they sent me a $75 gift certificate. I was surprised at the amount because I was expecting may $25 and no more than $50 but received $75 which left a very good impression with me about the brand trying to make things right. In addition to brands, there are numerous individuals that are often easier to connect with on Twitter than most other platforms. For example, I was up one morning reading a book that I purchased off Amazon and managed to connect with the author at 4:30 a.m. Like me, he is often up early and it was interesting to have some back an forth on Twitter. I have also connected with other individuals that would likely not respond on other platforms. I use Twitter to share updates about my business, to share blog post and for other things. I have found it to be a useful platform when used properly. You cannot just Tweet randomly (as a general rule) and just expect things to magically happen. If you are not using Twitter, you should try it out, but be very strategic about your approach. Don't let Twitter or any social media platform drain you of every second of your time.